A great movie, not so much because of the fighting scenes, but because of the story of a down and out loser and how he changes his life around. Rocky is a great movie, and the fighting is the very least of it. That’s because this isn’t really a movie about fights as much as its a film about a down and out boxer who doesn’t seem to have much luck in his life at all. He lives alone, has drunks for friends, makes little money from his matches, and has to take a job working as muscle for a loan shark just to make some extra cash. We spend the first half of the film getting to know this guy and what his life is like and then the second half watching him turn it all around, changing the relationships he has with characters from earlier on in the film. It’s some powerful stuff, and by the time we do get to the fight, we really care about this guy and can’t wait to see what happens to him. 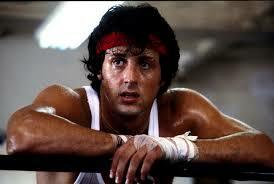 The movie Rocky is the story of a guy who had nothing going for him and got the chance of a lifetime. The main character, rocky balboa, (Sylvester Stallone) is a fighter who goes into gyms and fights in underground matches where he gets paid very little. The movie shows us this right away, opening with one of those fights and then showing us the aftermath, as he sits in a room with the opponent he just beat, bruised and bloody and waiting for a doctor to come see them. The guy who ran the fight enters first and pays both rocky and his opponent and we get to hear exactly how little they were both making. It’s because rocky makes so little money with his fights that he has to work another job. That other job is being the muscle for a loan shark named Tony Gazzo. This guy loans and then collects money and if the person doesn’t pay it back, he sends out rocky to break the guys legs. 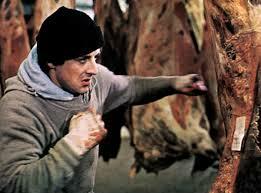 This movie is smart in the way it gives rocky a dark and gritty job like that, and yet it never shows us rocky doing it. In fact, at one point, we see what happens when gazzo sends Rocky out to collect. Rocky does everything he can to not have to beat the guy down, and in the end he gets enough money from him that he is able to walk away. This gets back to gazzo and rocky does get a bit of a tongue lashing because of it. In his spare time, when he’s not fighting and not working for Gazzo, Rocky takes care of his pets. He has two pet turtles that are his only company at home, and rocky visits the pet store on a regular basis to buy them food. He probably also keeps going there because he likes the shy, quiet girl who works at the store. This is Adriane (played by Talia Shire), and she wears glasses and constantly keeps her head down, afraid to look anyone in the eye. Adriane is the sister of rocky’s closest friend, Paulie. He meets him pretty early on too. Paulie, just like rocky, is a down and out loser. This guy hangs out at the bars drinking all day. He is overweight and not very happy with his life. When we first meet him, it’s because rocky has to go to the bar he’s at to get him and help Paulie get home. We learn from there that Paulie lives with his sister, Adriane. All of this is setup. In fact, nearly half the movie feels like setup, and that’s not really such a bad thing. The more we learn about this character and his life, the more we feel a part of it. Any movie can feature fighting, but this film wants us to fall in love with the character first. And in between all the meet and greets with characters who will be important later on in the film (and in the other films to come), we get little conflicts here and there. One of these conflicts involves rocky being kicked out of his locker at the local gym where he trains. It’s Mickey, an older man, who runs the gym, trains boxers, and is the guy who kicks rocky out of the locker. When rocky confronts Mickey about it, the old man doesn’t hold back on telling rocky what he thinks of him. Mickey tells Rocky that he could have been something special and instead he wasted his talent on becoming a two-bit leg breaker. This conversation seems right out of the classic Marlon Brando film on the waterfront, where Brando tells his brother in the back seat of a car, “I could have been a contender.” It’s the perfect kind of dialogue to emulate and use in a similar way and rocky handles it well. Things start to change for the first time for rocky on thanksgiving night. That’s when Paulie invites rocky over and tells Rocky that Adriane is expecting him. Rocky tries to confirm this with Paulie a number of times, making sure that Adriane knows he’s coming, and each time Paulie assures Paulie him that she knows. Of course, when he gets there, Adriane has no idea, and it becomes a conflict between she and Paulie and Adriane wants to hide in her room. Rocky ends up taking her out for the night, just to get her away from Paulie, and the two of them hit it off. He takes her to his apartment, removes her glasses, and gives her the slowest kiss imaginable. It all works. The movie spends enough time developing the characters and their lives that when things do start happening related to fights, we are completely on board. We care about these characters at that point, and so when we start learning of the great Apollo creed and how he was going to be in a big fourth of July, patriotic fight, until the other fighter got injured and dropped out, we wait to hear how Rocky will be brought in. it’s the name the Italian stallion that does it, with Apollo making it about how America is the land of opportunity and he will be giving an unknown contender a chance to fight the champ. This proposition is what brings Mickey out to see rocky. The old man comes to the fighter’s apartment and it’s a pretty powerful scene as rocky tells him off. Mickey literally has his hat in his hand, wanting to train rocky for the Apollo match. Rocky sees it as a guy who turned his back on him and never cared about him before, but now wants to use him for the glory. It isn’t until Mickey leaves the apartment that Rocky realizes this is what Mickey always wanted for him. He saw potential in rocky from the beginning and was only so hard on him because rocky wasn’t doing anything with that potential. The big fight against Apollo Creed is okay, but compared to everything else that happened in the movie, it’s hardly the most exciting or most interesting part. The introductions are cool with Apollo really proving to be a showman, riding in on a fake boat, dressed up like George Washington. They even get jams brown to perform “living in America,” for the crowd. The fight itself is fine, but compared to the other rocky films that are to come; it’s probably the weakest of the bunch. That’s okay though, because since it’s the first one, there’s really nothing to compare it to (raging bull didn’t come out until four years later.) the fight was really just the final moments of an incredibly interesting film. From the opening title that presents the name rocky in big bold letters that fill the size of the screen as the move across it, to the sensational music that plays throughout the boxer’s training, this is a pretty great movie.